Catch all the latest news and updates here. Three people died and three were captured in an encounter with police in Bihar’s Bahlolpur, Vaishali on Saturday, 16 March. Members of Pashtun, Mohajir, Sindhi and Kashmiri groups protested in Toronto, Canada on Saturday against the human rights violations by Pakistan. They also held a seminar. The YSR Congress Party on Saturday night announced candidates for nine Lok Sabha seats in Andhra Pradesh. YSRCP president Y.S. Jaganmohan Reddy has once again fielded his cousin Y.S. Avinash Reddy from Kadapa seat, which the latter won in 2014. Sitting MP P. Mithun Reddy will contest again from Rajampeta constituency. The remaining candidates are new. The BJP on Saturday, 16 March, deliberated on finalising the names of candidates for Lok Sabha elections, particularly for constituencies where polling will be held in the first phase. The names were discussed at the party's central election committee attended by Prime Minister Narendra Modi and party Amit Shah. Sources said the discussion was held on seats in Bihar, Jammu and Kashmir, Maharashtra, Telangana, Uttarakhand and the seven northeastern states. NDA leaders of Bihar will hold a press conference later today at JD(U) office in Patna for announcement of seat sharing in Bihar. Congress General Secretary UP-East Priyanka Gandhi Vadra arrives in Lucknow, to hold meeting with party workers today. She will take a three-day, 140 km long 'ganga-yatra' on a steamer boat, starting tomorrow, from Chhatnag in Prayagraj to Assi Ghat in Varanasi. Peter Mukerjea was admitted to JJ Hospital after he complained of chest pain. An accused in Sheena Bora murder case, Mukerjea is currently lodged in Arthur Road jail. The Congress has announced its candidates for five out of the total 11 Lok Sabha seats in Chhattisgarh, giving a chance to three of its sitting MLAs. The names of candidates for Surguja, Bastar, Raigarh and Kanker seats, reserved for the Scheduled Tribes (STs) and Janjgir-Champa, which is allocated to a Scheduled Caste (SCs) candidate, were declared late Saturday night. While speaking to the ANI he said that “we understand India’s concerns and are optimistic this matter will be resolved,” and that they “fully believe” in the matter. “After Wuhan summit last year the two way cooperation is on the right track, on fast track. We're satisfied with this cooperation, optimistic about the future,” he said. An earthquake with a magnitude of 5.5 on the Richter scale hit Indonesia's Lombok region at 07:07 UTC (Coordinated Universal Time) today. Former Supreme Court judge Pinaki Chandra Ghose is likely to be India’s first Lokpal, says reports. AAP on Sunday announced its 7th candidate for the Lok Sabha polls in Delhi. Balbir Singh Jakhar is to contest from West Delhi. The Bharatiya Janata Party and Janata Dal (United) sealed seat share alliance on Sunday. The BJP and the JD(U) to contest on 17 seats each, whereas the LJP will contest on six seats in Bihar. JD(U) clarifies that Lok Jan Shakti Party to contest on parliamentary constituency of Nawada. JD(U) to contest on LS constituencies of Valmiki nagar, Sitamarhi, Jhanjharpur, Siwan, Bhagalpur, Kishanganj, Supaul, Katihar, Munger, Nawada, Jehanabad, Nalanda, Katihar, Gopalganj, Madhepura, Banka, Gaya, Karakat and Jehanabad, JD(U) state president Vashisht Narain Singh confirmed. 'Suspicious package' shutters New Zealand's Dunedin airport: news agency AFP quoting police. The Congress on Sunday announced it will not contest on seven seats in UP for the upcoming Lok Sabha elections and leave them for the SP-BSP-RLD alliance in the state. “We are leaving seven seats vacant for SP, BSP and RLD. These include Mainpuri, Kannauj, Firozabad and whatever seats Mayawati ji & RLD's Jayant ji and Ajit Singh contest from,” Raj Babbar announced while addressing the media. The party will also leave two seats for Apna Dal. The decision is being seen as returning the favour of the SP-BSP-RLD alliance that decided not to contest from the Congress bastion Amethi and Rai Bareli in the state. 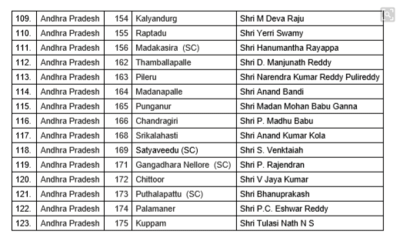 The BJP release its list of candidates for 123 seats of Andhra Pradesh and 54 seats of Arunachal Pradesh. At least eight dead in suspected jihadist attack on Mali army camp. More details awaited. Maharashtra Navnirman Sena (MNS) issued a statement saying it has decided not to contest the 2019 Lok Sabha elections. Dravida Munnetra Kazhagam (DMK) has released a list of 20 candidates for Lok Sabha elections. Rajya Sabha MP Kanimozhi to contest from Tuticorin while former Telecom Minister Dayanidhi Maran to be DMK candidate from Chennai Central. Another former Telecom Minister, A Raja, to contest from Nilgiris. Ethiopian minister said Black box data shows "clear similarities" between Ethiopia and Lion Air crashes. The Independent reported that police in Stanswell, Surrey in England have declared a terrorist incident following a 1-year-old man was stabbed in an attack. “Whilst this investigation is still in its infancy, it has hallmarks of a terror event, inspired by the far right, and therefore it has been declared a terrorism incident,” said Assistant Commissioner Neil Basu. Four people were killed and 10 injured in Pakistan on Sunday when a bomb went off on a train track in the resource-rich province of Baluchistan, where separatist rebels have been fighting the security forces for years. Boeing "finalizing" MCAS update after Ethiopia crash, reported AFP.